Megan Vandemeer was in trouble. She had found her fiance cheating and immediately broke up with him. The trouble was she hadn’t told her mother about breaking up with Jay and the wedding was now only a few days ago. Megan will find a solution when a man she met on the plane ride will volunteer to help. Josh McMillan was going to Kansas to find out who really stole his patent before the deadline was too late. His plan was to get close to Vandemeer and as luck would have it he would meet a Vandemeer on his plane to Kansas, except it was the daughter. His plan will change as he volunteers to help the daughter, but Josh will soon be in way over his head. 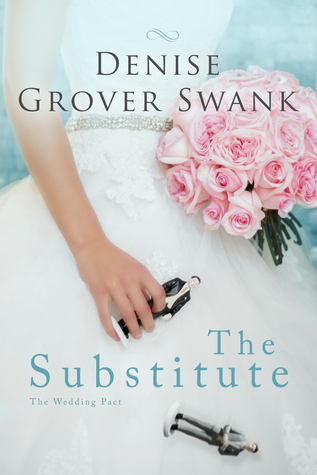 The Substitute is the first book to the series Wedding Pact by Denise Grover Swank. I really loved this book, it was cute, fun, and a little crazy. I will admit that it was also very predictable but I really didn’t mind that. I was just enjoying the story. The concept of the story is that three friends were told that the men they were going to marry would not happen and that there would be another man who would come into each of their lives. So Megan is first of the friends whose wedding will have a problem I liked Megan’s character. She was a good person who had a lot of things going for herself except she was afraid of her mother. It wasn’t that the mother was bad but she could be judgmental. The mother gets better and you find out a little information that helps you like the mother a lot more. Then there was Josh’s character. I liked him for all his planning and you knew he was not a bad guy or even malicious. He will be lying to why he was really helping Megan, but he was trying to help his employees keep their job. So the attraction between them is almost instantaneously. They fight it but with close proximity there is no help for them. The friends, Blair and Libby, of Megan were polar opposites of each other. They had their own parts in the book whether they were helping or hindering the crazy scheme of Megan. I liked her friends and I know that I will enjoy reading their stories. Philippa Sanders was trying to help get a letter her sister had foolishly written to a rake, the Earl of Erskine. Philippa will soon need help when she is discovered by none other than the Earl of Erskine. The situation will quickly get out of hand when they are locked in together. Things will quickly spiral out of control and Philippa and Blair will find themselves together permanently. 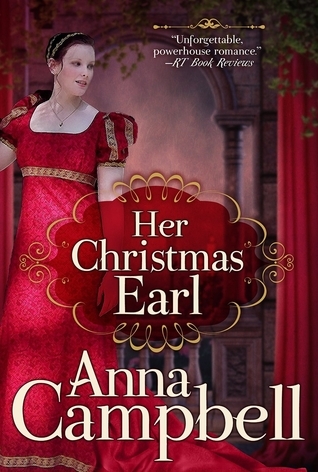 Her Christmas Earl is a novella from Anna Campbell. I thought that this was a well written novella that certainly captured my attention. I have read several of her books and they have always drawn me into the story, I knew that this novella would be no different. This novella had a sweet romance that was built from lust to love. So Philippa’s character was a good sister trying to help. She is someone who is forgotten about or stepped over, particularly by her family. I liked that there was a fire within Philippa, otherwise she would have been too boring. To bring out her fire was Blair, the Earl of Erskine. I liked Blair’s character. He was certainly a rogue but that did not rule his life. I liked that he never tried to trick Philippa and was always truthful, well except for initially trapping them in the closet. Together this couple will work perfectly it will just take awhile for Philippa to trust that Blair truly wanted her and loved her. Tagged author Anna Campbell, Christmas, Her Christmas Earl, marriage, novella, party, rogue, society, Trapped! Beckett Murda was one of five soldiers that was out to find the truth about what happened that night when their team went down. Beckett, along with his team mates were getting close but the closer they got the more danger that followed. Katherine “Kat” Rixbey was just coming into the chaos but she wanted to help her brother and his teammates. As a prosecutor Kat has been working on high profile cases which will lead her to investigating the men that were behind her brothers and his teams misfortune. Kat will do what it takes to help. Hard to Let Go is the fourth book to the series Hard Ink by Laura Kaye. Really loved this book, loved this series. I couldn’t get enough of these tough but broken military men whose mission was to clear their names and figure out what had happened. Beckett was the main guy of the book and I have to say that I really loved him. He was a mess after the mission but it was really because of his past. He had a tragic past that made him think he was nothing. Kaye really makes you hate Beckett’s father. Then there was Kat who had a good childhood but her present was getting screwed up thanks to an ex boyfriend. Kat in my opinion was a strong woman but she was not invincible, and there will be a couple of situations to prove that fact. The relationship between Beckett and Kat was not on friendly terms. They rubbed each other wrong but there is big time chemistry. The chemistry was steamy but there was more to their relationship that is once they let themselves want more. Now the mission will take over a big part of the book which it should as it was concluding. There were a lot of pieces that needed to be explained, and it will be. I thought that Laura Kaye wrapped up the mission really well as she put all the pieces together. With the fourth book finished the series is over but it looks like there will be another book coming next year. This book will be about Nick and Becca and a wedding. Marissa Vanderson is a sheltered wealthy heiress that had a tragic past but she has had enough being protected. She wanted to live her life and experience things. She will enlist the help of a bartender, Dane Sinclair, but she will soon find out that there might be dangers out there that she wasn’t expecting. 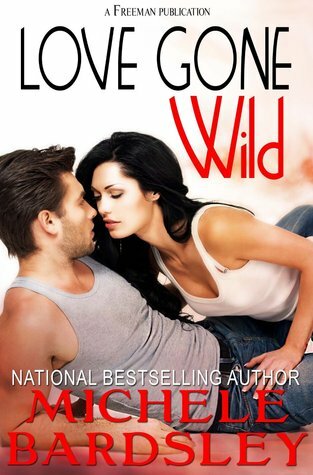 Love Gone Wild is a novel by Michele Bardsley. This was a hard book to write a quick summary because there are many parts to it. For me I thought the story was humorous and wacky at times with the situation that comes up. At times the story was a little too silly for me but overall I liked it, just didn’t love it. From how I wrote the summary it could be considered that Marissa was just a pampered heiress but she wasn’t allowed out of the protection of her parents because her brother had been kidnapped and her older sister killed all when she was a child. That part threw me when I started the book because the cover pretty much looks like a normal contemporary romance novel. Well there is certainly romance that Marissa tries to make happen between Dane and herself. Dane feels this romance but he doesn’t want to be with Marissa because she was a heiress like his ex-wife. That fight will only last so long for Dane. Well Marissa has a list that she wants to cross off before her birthday which was a list her older sister had helped create. Dane is helping Marissa cross things off that list. Now that sounded fine but then the plot changes from Marissa to a serial killer and then to a US Marshall and another woman who is following Marissa. Needless to say the plot gets wacky as I said above. Though don’t worry because all these plots will interconnect in a surprising way. Mrs. Vanessa Wynters was a companion to an elderly woman who had a love of photography and travel which was shared with Vanessa. She will be devastated when this woman dies. Vanessa knows that she will have to leave once the funeral is over but she will find herself with a new opportunity. Though danger will not be far from Vanessa and the family she was staying with. Viscount Adrian Marrable had lost two wives and swore that he would never fall in love again. Adrian will find love with Vanessa but before he could he had to find out if his wife was truly dead and where were the rest of the family’s jewels which disappeared that night. Shades of the Past is a novel by Kathleen Kirkwood. Really loved reading this book, it was one that I could not put down. After reading my first and only book from Kathleen Kirkwood I figured I would try another of her books but she really hasn’t written too many. I had found this book as a free book at amazon awhile ago and I quickly snatched it up. Now although it was initially the author that pulled me to get the book it was the title that intrigued me. I liked the sound of the title and it worked well with the book especially as it dealt with some paranormal aspects, mainly ghost within the story. So with this book there are plenty of things that will happen and mostly there are twists, and there are several big ones that change everything you thought about some of the characters. I wouldn’t go into detail because I don’t want to ruin the surprise. Though I will say that Kirkwood really weaved a well balance story and incorporated the twists really well into the plot. After saying that I thought about what else to write because I really don’t want to spoil any surprise. So instead of saying anything about the characters I will say that Kirkwoods description was really well done. She wrote about Vanessa’s work with the photography which I actually found interesting and informative. It might have seemed that Kirkwood didn’t need to put all that time in description of photography but it is a big part of the story. Tyler Jenkins was working as a ranch hand but will quickly find he will be doing twice the work when he starts to help out a widow. Tyler didn’t find the task exhausting as it gave him an excuse to be by Janie. Janie Smithwick has been widowed for a year now and the pain was still there, though she will find that she was mending as she started to desire again. Janie should have been wanting someone closer to her age but she will be attracted to a ranch hand. 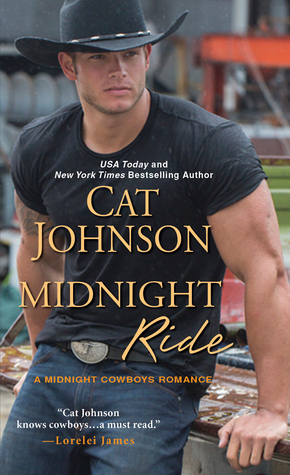 Midnight Ride is the first book in the series Midnight Cowboys by Cat Johnson. I really liked this book. I thought it was a great start to this cowboy series. Within the book there was some fire and passion that burned between these characters but it was sweet as it was a courtship as well. Ever since reading the series Oklahoma Nights I was waiting to read Tyler’s story where he had appeared. I had liked his character right away. He was charismatic, a flirt, funny and sweet. Now although he had a way with the ladies I wouldn’t say he was a true player. He definitely got around but it wasn’t as much as others thought. I liked that he was giving up his ways the moment he saw Janie. Janie’s character was someone who was still healing. Although she was ready to move on, she was scared especially to move on with a man who was over 10 years younger than her. Throughout the book I kept thinking that nothing can really come of this because of the age difference but love does not work around ages. If you love somebody, you love them. I liked that Cat Johnson was letting the woman, a thirty six year old, find love with a younger man, a twenty five year old. For me this age gap is pretty common with historical romances, though its usually the man who is 10 years older than the young woman. So the second book will be coming out this month and the third book will be coming out in February of 2016. Can’t wait to continue the series. Louisa “Lou” Honeycut could not marry a man she didn’t love, so she ran as fast as she could. Lou will need a way to get faraway from her father as quickly as she could, which will lead her to taking an adventure. Sam Rawlins is an adventures tour guide, his job was to make sure the people who signed up got their perfect adventure. Sam will be in over his head when dealing with Lou and her need for adventure. 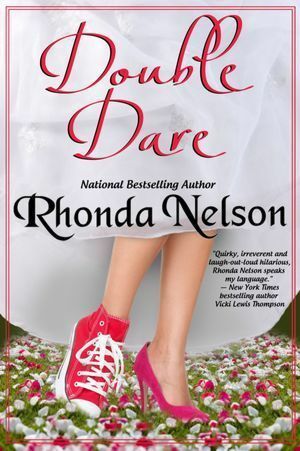 Double Dare is a novel by Rhonda Nelson. I thought this book was cute. It was a simple plot, quick and fun to read. I had gotten this free from amazon. I have never tried anything from Rhonda Nelson but I always like to try new authors, so I gave her a shot. When I was done with the book I found it interesting to read some comments about this book that I had found. A lot of people thought there were typos and the whole tour guide falling for the runaway bride was unrealistic and not interesting. Now I am not saying that this book will win any awards but I thought it was just fun to read. Its a book that is fiction. Plots don’t always have to be realistic. I will admit I do like when the books are realistic but this book is also a romance novel. Things in romance evolve quicker than real life. So now back to my review. Well as I said above I liked the book. I thought that Lou was a young woman that needed to live a little to realize what she wanted to do. Sam was a man that needed to break the rules and have fun. I liked that together they helped each other get what they needed without them knowing what they truly needed. Within this story there were things that were out there and on the verge of being silly but it still brought an element of fun to the book. I did think that the scandal that Lou makes is a little over the top but again its fiction and in a way it is kind of believable since gossip magazines are over the top. Now as far as reading another book from Rhonda Nelson I would have to say that I would be up for another book by her. It will probably be much later on as the pile of books I want to read never gets any shorter.